BOSTON, MA -- Pay for public college presidents continued to climb in 2015, and a growing number of chiefs topped the $1 million mark, according to results from a new study. She was followed by Michael Gottfredson, former president of the University of Oregon; Michael Young, president of Texas A&M University's flagship campus; William McRaven, chancellor of the University of Texas system and a retired United States Navy admiral; and Mark Becker, president of Georgia State University. 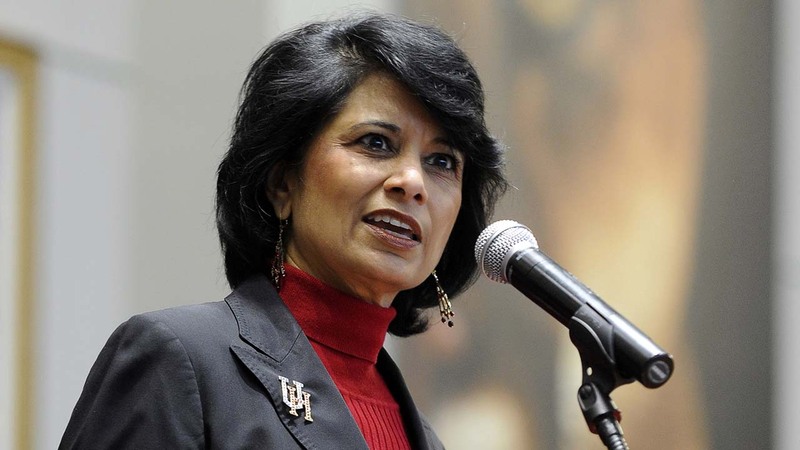 "I can say unequivocally that Chancellor Khator's salary is appropriate based on her stellar track record and the achievements she has helped the UH system and the University of Houston obtain," Tilman Fertitta, chairman of the University of Houston's board of regents, wrote in a letter in response to the Chronicle survey. "Schools are resisting changes, but they're going ahead and continuing to make these large payments to university presidents, and I think it's the height of irresponsibility," said Richard Vedder, an economist and director of the Center for College Affordability and Productivity at Ohio University. Along with base salaries, the survey tallied bonuses, retirement pay, severance packages, and deferred compensation - payments that were set aside in previous years but paid in 2015, often used as a retention tool. The annual survey released on Sunday examined pay for the leaders of 236 colleges and school systems. "Higher education has become a competitive market for leaders. We compete for the best, and we want to keep them," Hank Huckaby, chancellor of the University System of Georgia, said in a statement. A spokesman for the system added that, at Georgia State, Becker's $500,000 bonus last year came from a private foundation. Next year, two presidents - McRaven and Young - are scheduled to exceed $1 million in base salary, which would be the highest since The Chronicle started collecting that data in 2009. Before, the largest was $851,000, paid to E. Gordon Gee in 2013 as part of a $5 million retirement package during his last year at Ohio State.